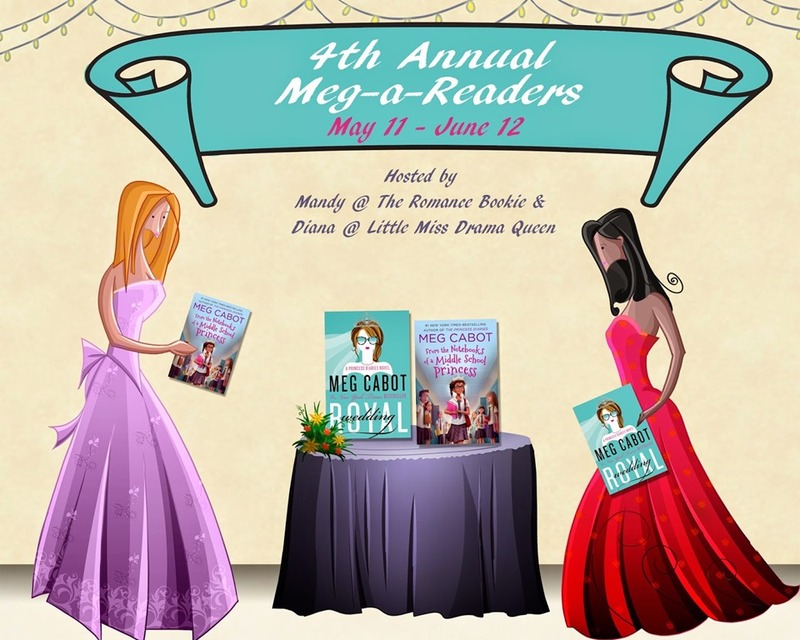 As a Meg Cabot fan I have the privilege of participating in the 4th annual Meg-A Readers Blog Hop hosted by Mandy at the Romance Bookie and Diana at Little Miss Drama Queen. As an official “Meg-A Reader” can I tell you how thrilled I was to get an advanced reader copy of Royal Wedding? I know ARCs are common place for “real” book bloggers but not me! 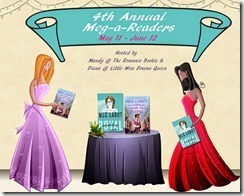 So when I actually got one from Meg Cabot’s publisher I let out a SQUEEEEE so loud I think the neighbors heard. I then had to put my Princess Diaries binge read into race gear so I could get my “Meg Cabotyness” on and enjoy Royal Wedding in full sequence. 1. 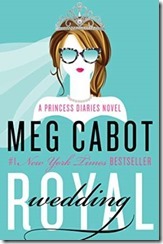 Limos – No Meg Cabot novel is complete without them and Royal Wedding is no different. Mia actually gets driven around in a Hybrid Electric Livery Vehicle now that she’s an environmentally conscious adult but Grandmère still uses a traditional limo and in this book we get details about what it’s like inside. 2. Food – I love the descriptions of food in fiction novels, especially the delicious meals the royals eat in the Princess Diaries novels. In Royal Wedding we get a delicious list of all the food Marie Rose, chef for the Consulate General of Genovia, leaves in Mia’s fridge. Yum! 3. Romantic Island Vacation – If you’ve read the synopsis of the book you already know that Michael proposes to Mia during a romantic Caribbean getaway. Just wait until you hear about this place! I’ve already gone back and read that section of the book twice in an effort to take a little fantasy vacation myself. 4. Olivia Grace – This is the name of Mia’s long lost half sister who gets introduced in this book. I loved her and you will too. In fact, if you want to get to know her better you can read the middle grade novel with Olivia Grace’s version of the story in From the Notebooks of a Middle School Princess. It is of course not the whole story, but is delightful just the same. 5. Rocky – We actually don’t get to see much of him in Royal Wedding but we hear a lot about him. He’s not a baby anymore. He’s an adolescent boy and he’s obsessed with farts. I have a feeling that we may see more of Rocky in the Middle School Princess series. I hope so anyway! 6. Storyline hinted at in the previous books is finally resolved – I’m not going to tell you what storyline I’m talking about but if you think about it enough you’ll know which one I mean. It was just what I wanted to have happen. 8. Genovian drinking song – Yes there is such a thing. The lyrics are basically “Forgive me Mother for I am drunk again!” I won’t tell you who sings it though. 9. Grandmerè – She’s back and she’s better than ever! What were your favorite things from Royal Wedding? This entry was posted in Uncategorized and tagged chick lit, Meg Cabot, Princess Diaries. Bookmark the permalink. Oh I might have missed something with number 6, I’ve got an idea but I’m not sure if were on the same wave. Loved that you picked the little things about the book, although really with so much going on I guess we can’t say too much. My favorite thing was probably just going back into that world. I figured so many others would be giving traditional reviews I wanted to do something a little different and also be a teaser for people who haven’t read it yet. Lilly really redeemed herself for me in this book. It was nice. I stayed up WAY too late Sunday night and plowed through this. I was so excited when I first heard about an adult novel featuring Mia and the gang – but I also felt some trepidation. I really thought Forever Princess “ended” the series well, and on a high note. So by revisiting the characters as adults, would my fond memories be “ruined?” Luckily the answer was no. I really enjoyed Royal Wedding a lot. Mia still features a lot of the characteristics that made her so charming in a YA world, but you could also tell she had “grown-up.” And I love how Cabot tweaks the nose of the romance genre a bit in her stories but you can tell she LOVES the genre, and that always pleases me. Really my only disappointment is I didn’t get a Tina/Mia scene where they’re talking about romance novels. Those were always some of my favorites in the earlier books. I agree on the Tina/Boris storyline – which is why I think I missed a Tina Reads Romance Novels scene so much in this story. Also I was majorly bummed over Mr. G. But I loved Grandmere, I loved that Olivia isn’t a cookie-cutter of Mia (that girl has her own, distinct, personality), and you’re so right – Lilly is a vast improvement in this book over the YA series. I’ve already requested Olivia’s first book from the library. I think you nailed it; the Tina/Mia chemistry just wasn’t there in this book. And quite frankly, I don’t think there was much room for it anyway. P.S. I probably have the ethnicity all wrong, but I totally picture Mindy Kaling in this role.